I ran out on the Trade In today searching for a mako or a blue shark that would be big enough for an IGFA line class record. We have had a bumpy shark season this year and were really hoping to have some action today. We ran out in a moderate chop with winds at 10-15 out of the SW and headed for the 20 line. Once I got to the general area I wanted to be I marked some bait so we threw the chum in and started our drift. We had a solid 1-1.5 knot drift to the NE in green 66 degree water. We started getting some action after an hour and a half. The first fish was a small Mako (about 60 pounds) which snuck by our long teaser and ate Maureens pitch bait on 2# test which we had laying in the water boat side. He took a run but it was short lived as he only had the back half of the bait. The next hour was nonstop action playing with two more small Makos, 2 small blue sharks, a dusky, a brown, and even a small tiger. I was able to get some underwater video which I am stoked to see. If it turns out as good as I think, I will post a quick edit on my youtube channel at http://youtube.com.captainrickywheeler, so be sure to check it out. The action tapered off so I made a move back up and at this point it was a very choppy 4-6 feet with a stiff 15-20 knot SW wind so we pounded our way up to make another drift. After an hour and 40 minutes we had another pup mako come up for the teaser and come in to the boat, but it was too small to bother with. Plenty of action on pup sharks made for a fun day. You know those days where everything goes perfect and you can do no wrong? Today was one of those days. You only get a few of those a year, so I truly took it all in on this one. 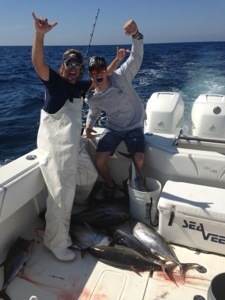 I fished on the 39′ Sea Vee, Good Karma today. We ran out towards the Wilmington Canyon hoping to stay away from the crowd and it payed off. We pulled into 80 fathoms and saw a ton of chick birds and a color change from dirty green to clean green with scattered weed. I was marking a lot of bait on the sounder at 60-120 feet when we pulled in. We were putting out the spread and WHAM covered up! Mix of small yellowfin and small bluefin tuna. We reset and this time we had 3 solid fish on and one throwback yellowfin. 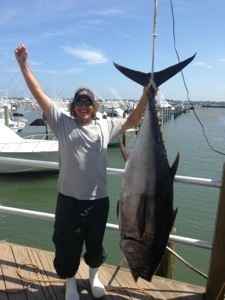 2/3 bigger tuna pulled off on their run and after a solid fight we put a 100# BigEye Tuna on the deck. The action remained solid all day with the tunas eating anything we put out. We had our 5 man limit by 11 am and wound up catching close to 30 yft (26-34 inches), 8 football bluefin tuna (1 keeper), and the bigeye. As we were cleaning up I saw a solid school of tunas under the boat and pitched a jig over the side down to where they were and immediately hooked up. What an epic day of action packed fishing! Can’t wait to do it again. I will be posting up more as the season goes on so be sure to SUBSCRIBE to my Youtube Channel at http://youtube.com/captainrickywheeler to keep up with the action. 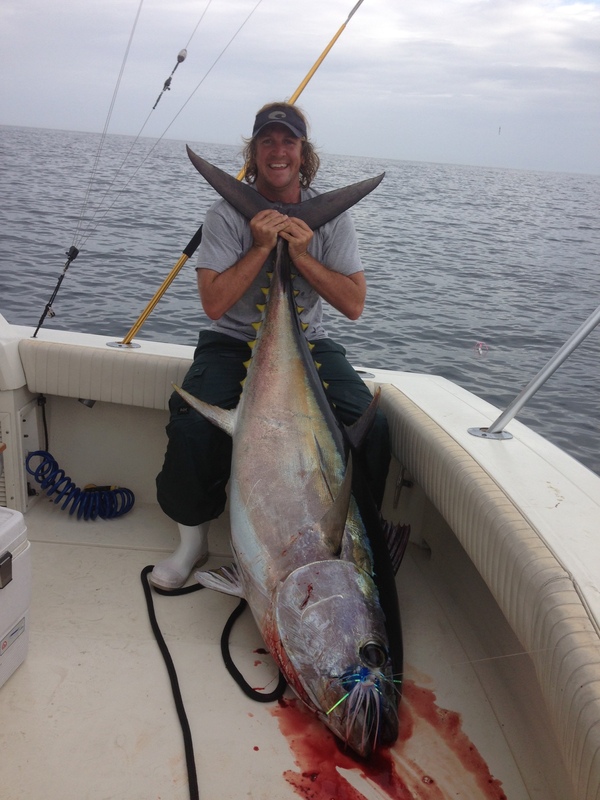 On another note, I am headed out in search of some yellowfin tuna tomorrow. Stoked to finally be making it offshore. Everything is starting a little late this year in our offshore scene. Check back for a report. Someone once told me, “If you do not succeed, try, try again.” With a decent report of a concentration of blue sharks caught in the South Jersey Shark Tournament yesterday we got some numbers where the fish were and ran out with the silly string again (2# test line). We were hoping to cash in on this concentration of Blue Sharks as the right size fish for an IGFA line class record were caught there yesterday. The water temperature was 63 degrees and still a dirty green like we have had every trip this year so far. Our drift was to the NNE today and the wind went from 5-20 in no time out of the SW. We put in about 4 hours of fishing without a single bite. We packed it up and headed for a wet ride home since the seas were growing into a 4-7 foot nasty chop and were only forecasted to increase. I hate to use this quote, but it was the “you should’ve been there yesterday” kinda day. We decided to go bottom fishing on the Trade In and put a little meat in the box. It was a beautiful, calm day and we started out on an inshore wreck about 10 or so miles out of GE Inlet. The action was slow here on sea bass and most fish were small so we ran out deeper to another wreck. There wasn’t much of a drift at all and the drift direction kept changing. We picked through some fish throughout the day, but overall the action was slow. We had water temps at 64 degrees. We ended our day with about 20 keeper sea bass, 8 ling, and 1 flounder.